Photos by Dave Bushell, no reproduction without permission. These photos of ‘Shalom Salaam’ were taken by Dave on location in Leicester and in Pebble Mill Studio A. 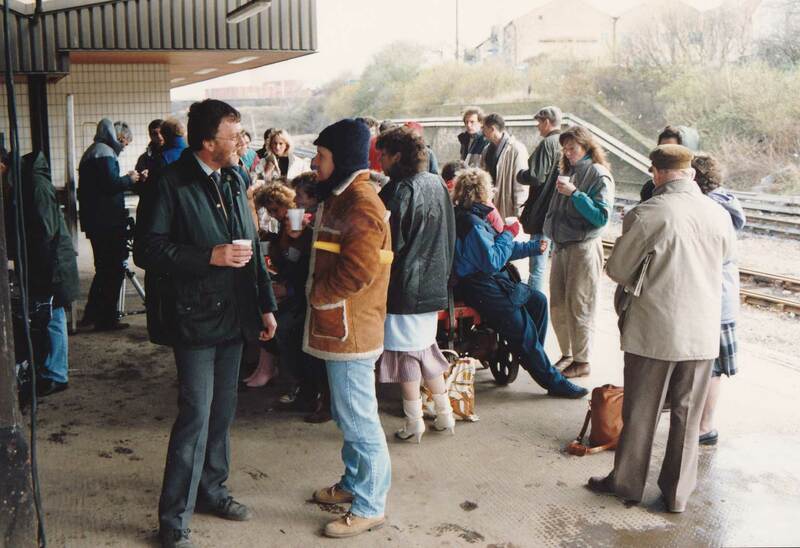 1 – Tea break on Leicester Station. John Abbott (Engineering Manager) in discussion with Gareth Jones (Director). Crew and cast frolic gently in background. 5 – Clare Holman (Jackie) trying to keep warm on Leicester Station. ‘Shalom Salaam’ was written and directed by Gareth Jones, and produced at Pebble Mill by Chris Parr. The 1989 series follows the story of a Jewish boy (John Cater) and a Muslim girl (Mamta Kaash) who fall in love whilst at college.